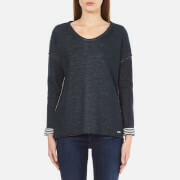 Women's dark blue sweatshirt from BOSS Orange. Cut with a relaxed fit, the jumper showcases a round neckline and long sleeves with dropped shoulders and contrasting striped cuffs. Complete with raw edges, a branded metal tag and a dipped hem to create a longer rear length. 64% Cotton, 33% Wool, 3% Polyamide Model is 178cm/5'10 and wears a size S.
Women’s ‘Valid’ black turtle neck sweatshirt from Swedish brand Cheap Monday. Crafted from a soft cotton blend jersey, the regular fit jumper features an asymmetrical front, extended sleeves and deep side slits. Complete with a ribbed turtle neck and a slightly shorted back. 60% Cotton, 40% Polyester Model is 178cm/5'10 and wears a size S/UK 8. Women’s ‘Vote’ black sweatshirt with a contrast fence patterned top section from Cheap Monday. Crafted from a stretchy cotton blend, the fitted sweatshirt features a high rib neck and raw edge sleeves. Complete with an extended ribbed hem with a silver-tone zip. 90% Cotton, 5% Viscose, 5% Elastane Model is 175cm/5'9 and wears a size S/UK 8. 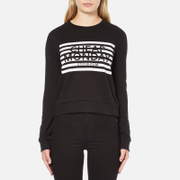 Women’s ‘Win Stripe’ black sweatshirt from Cheap Monday. Crafted from soft cotton blend jersey, the regular fit sweatshirt features a signature white striped logo print on the chest. Complete with a ribbed crew neck, hem and cuffs. 65% Cotton, 35% Polyester Model is 175cm/5'9 and wears a size S/UK 8. 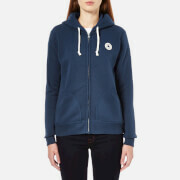 Women’s pure cotton grey sweatshirt from Converse. Constructed with a classic sweatshirt design, features include: a crew neckline, dropped shoulders and ribbed knit detail to the neck, cuffs and hem. Converse’s classic ‘Chuck Taylor All Star’ logo patch is printed on the chest and has been updated with a camouflage print instead of the usual plain white background. 100% Cotton Model is 175cm/5'9 and wears a size S.
Women’s full zip hoody with interesting metallic inserts from Converse. An adjustable hood with a drawstring fasten, split kangaroo pockets and ribbed knit detail to the cuffs and hem comprise the design. Crafted from pure cotton, metallic detail features on the sides and as Converse lettered branding on the edge of the hood. 100% Cotton Model is 175cm/5'9 and wears a size S.
Women’s heather grey hoody with a signature Chuck Taylor woven brand patch to the chest from Converse. Crafted from soft cotton blend jersey with a garment washed finish, the full zip hoody features a drawstring adjustable hood and two angled pouch pockets. Complete with a ribbed hem and cuffs. 80% Cotton, 20% Polyester Model is 178cm/5'10 and wears a size S.